Mexican supermarkets dot the landscape of Austin like bluebonnets in the springtime. 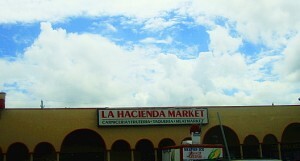 While La Michoacan has long been my favorite I’ve always had a love for La Hacienda as well. When I assigned myself this barbacoa project I decided to range outside my normal territory and head north where I soon spotted an outlet of this local chain. The typical market taqueria ordering system is in place at La Hacienda. As I approach the girls behind the cash registers they’re partying nice and loud. One gal, resplendent in a riot of pink sneakers, purple shorts and a magenta t shirt is about to have a fit she’s laughing so hard. The gray skies of Austin on this day are lifted by these beautiful ladies making a beautiful noise. I request one barbacoa taco on corn tortillas, pay $1.62 and make my way to the steamline where a dozen or so hot chafing dishes are loaded up with the meats of the day. The hot line is a thing of beauty with tripas, carnitas, refried beans, fried jalapenos, fried giant green onions and a multitude of simmered casserole style mystery dishes. I proffer my receipt to the taquera and she begins building my taco. The giant pile of shredded head meat from a cow is handed over straddling doubled up, freshly griddled corn tortillas. This barbacoa is one of my favorite styles. Little crispy bits of meat are entangled with luscious bits of melting fat to create a glorious mess of a taco. A cold-line of limes, green salsa, orange salsa, pico de gallo and chopped onions provides all the garnish you might need. I always go divorceado style and give half the taco the green and half the taco the other option on these occasions. Both salsas are excellent. The green is an emulsified chile Poblano, the orange a creamy sauce with lots of rehydrated chile seca. This is an enormous, seriously delicious taco. When La Hacienda entered the Austin market years ago with their Riverside Drive location I was of the opinion that they had the finest carnitas in Austin. Their barbacoa is also a righteous contender for finest in town. This entry was posted in The State of Barbacoa In Austin Texas. Bookmark the permalink.